Congratulations to USF Sacramento BSN Graduates! 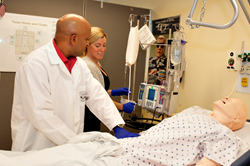 VA partnership helps meet growing need for veteran-centric nurses. “The more I talked to and worked with the veterans during my education, the more I realized why this program is special,” said Amy Phan, one of the 18 USF nursing students graduating this week. Nurses participate in educational exercises at VA Northern California Health Care System.